Sonny and Barkis will NOT take no for an answer. Spring has sprung. Like my sweet mobile? It was made by my friend Joan, and they’re for sale with any happy message you can imagine. Getting to Australia is easier than you think. It’s like flying to Hawaii but just a few bar drinks and a couple of in-flight movies longer. There are easy nonstops from LA on Virgin Australia (which makes you feel like a rock star) and Qantas. C’mon down under! What conferences are YOU attending this summer? Let me send you a letterpressed bookplate. This is my friend’s dog, Emma. I think it’s time for another caption contest. Winner gets a free book! Something old is new again. Authors love reissues, because it gives us a chance to offer our books to an expanding readership. I suspect some readers might have other opinions. 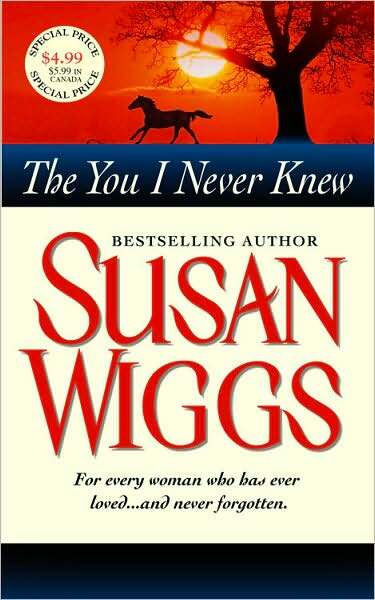 Anyway, I don’t know about you, but I’m excited about The You I Never Knew, a March release from Grand Central. It’s got a fresh new look and comes with a bonus reading group guide, and a $7.99 cover price, so what’s not to like? Here is a false start of a cover for the original edition of this book. It was never used. Simply not the right look. For a little backstory on this particular book, check out my blog here http://www.susanwiggs.com/2008/07/27/backstory-the-orphaned-book/ and here http://www.susanwiggs.com/2008/07/28/. What are your feelings about reissued books? Do they make you bitter with rage because you got hoodwinked into buying a book you’ve already read, or are they an opportunity for new readers to catch up on an author’s work?